• Assault into the kill zone to search dead and wounded, to assemble prisoners, and to collect equipment. The assault element must be able to move quickly on its own through the ambush site protective obstacles. A hasty ambush is conducted when a unit makes visual contact with an enemy force and has time to establish an ambush without being detected. The conduct of the hasty ambush should represent the execution of disciplined initiative within the parameters of the commander’s intent. The actions for a hasty ambush should be established in a unit SOP and rehearsed so Soldiers know what to do on the leader’s signal. An area ambush (more than one point ambush) is not conducted by a unit smaller than a platoon. This ambush works best where enemy movement is restricted. Once the platoon is prepared, the area ambush is conducted the same as a point ambush. 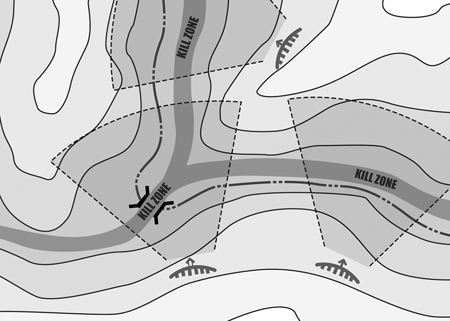 The dominating feature of an area ambush is the amount of synchronization between the separate point ambushes. Area ambushes trap the enemy in a network of attacks from multiple concealed positions. These ambushes are carefully oriented to avoid “friendly fire” and yet maximize combat power against the enemy. (Source: SUTS2 – The Small Unit Tactics SMARTbook, 2nd Ed. / www.TheLightningPress.com). Area ambushes require more planning and control to execute successfully. Surprise is more difficult to achieve due to the unit’s dispersion in the AO. Having more than one ambush site increases the likelihood of being detected by the enemy or civilians. This major disadvantage is offset by the increased flexibility and sophistication available to the leader. Point ambushes are set at the most ideal location to inflict damage on the enemy. Such ambushes must be able to handle being hit by the enemy force from more than one direction. The ambush site should enable the unit to execute an ambush in two or three main directions. The other directions must be covered by security that gives early warning of enemy attack.